WHEN THE official DJ for the concert, DJ Black, took the stage on Saturday night, everyone was prepared for some good music but DJ Black managed to kick it up a notch, immediately sending the audience into party mode. At one point, the auditorium of the Conference Centre was transformed into a hip club. It became a spontaneous dance hall session, with everyone dancing and singing along to the tunes. 'Mr. Tuntum' continued to mix a selection of Western and African tunes until the artistes arrived. Acts on the night included Tic Tac, who was like a breath of fresh air because he had not performed on the big stage probably since the Ghana Music Awards. 4 x 4 were a blast; the two songs they performed were all that was needed to make a statement about the quality of their latest album. Okyeame Kwame also performed his heart out to the expectant audience. He paid tribute to Michael Jackson by performing a choreographed piece with his dancers. Samini also performed a few of his past hits. Sarkodie was the ultimate hip life star on Saturday night. He did not need to tell anyone that he is the fastest MC in Ghana, he arrived on stage with a clock to show how many words he could spit on a per second basis and it was fun to watch. He managed to get the whole auditorium to shout 'check my flow' in unison. Sarkodie guaranteed a place in the hearts of audience members as the best Ghanaian act of the night, without a doubt. Like John the Baptist in the Bible, Sarkodie's electrifying performance paved the way for Busta's take over. The nearly two-hour performance by the American hip hop legend truly lived up to the hype. 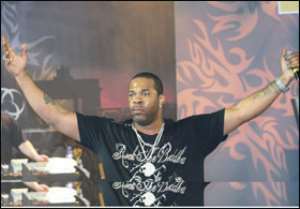 Busta, ably assisted by his ever-present hype man Spliff Starr, kept the audience on their feet, screaming at the top of their voices, singing and dancing along from start right to the end of their slot. The concert, which was in celebration of MTN's second anniversary and Ghana's qualification to the World Cup 2010, was not the only fun activity that took place in the environs of the Conference Centre. A float, which ended in an open-air jam at the car park of the stadium with the Busta concert beamed live on the big screen, was MTN's way of ensuring that everyone was part of the celebration.